Despite her unique challenges, Kenya like any other country in the world has gone through different stages of growth under dynamic circumstances that are espoused through different political leaderships at respective times. In 1963, Jaramogi Oginga Odinga who later became Kenyaâ€™s founding Vice President shelved his ambitions of becoming President in favour of President Jommo Kenyatta who was then still imprisoned by the colonial government. Kenyatta was released afterwards and by mutual consensus was made the first Head of State. After a few years of independence Kenyatta and Jaramogi had a strained political relationship mainly due to ideological differences. That caused Jaramogi to be replaced as Vice President. The centre of political power remained under the absolute grip of Jommo Kenyatta with Kanu party as the sole and dominant political institution in the country. Kenyatta remained the only political powerhouse running the government until his demise in august 1978.His death paved way for his then Vice President Daniel arap Moi to take over, holding Presidency until 2002 when he retired as per the constitution after serving two full terms of five years each since the first multiparty election that was held in 1992 following the repeal of section 2a of the then constitution of Kenya. The introduction of multi party was culmination of many years of agitation by the civil society and political activists who pushed for the expansion of democratic space and end of the Moi and Kanu dictatorship. Post 1992 saw the country undergo political changes including emergence of political parties with ethnic lineages. At the time of President Moiâ€™s retirement, the countryâ€™s presidency had been occupied by only two individuals; Kenyattaâ€™s 15 year period and Moiâ€™s 24 years all under Kanu political establishment .During most of that time, the country had one opposition figure in Jaramogi Oginga Odinga who passed on in January 1994 after suffering a massive cardiac arrest. The rivalry between the Kenyatta political establishment and Jaramogi Oginga Odinga led to polarization of the country along ethnic lines. The rivalry between Jaramogi and Kenyatta was interpreted by majority of Kenyans as a silent ethnic political battle between the Luo and the Kikuyu community. In 2002, Kenyans opened a new chapter in the countryâ€™s history by electing President Mwai Kibaki who won with a big margin against his kinsman Uhuru Kenyatta; the son of the founding President. Significantly ,Raila Odinga; the son of the founding Vice President and Kenyaâ€™s most significant opposition figure Jaramogi Oginga Odinga played a major role in Mwai Kibakiâ€™s Presidential campaign. After Kibakiâ€™s 2002 victory, Raila became the most prominent political figure in Kenya. Having played a considerable role in the Kibaki campaigns, Raila expected a bigger reward than just a Cabinet minister. Railaâ€™s supporters called for the implementation of an alleged MoU that could have seen Raila appointed as Prime Minister. The quiet rivalry between Kibaki and Raila reached fever pitch during the November 2005 referendum campaigns. 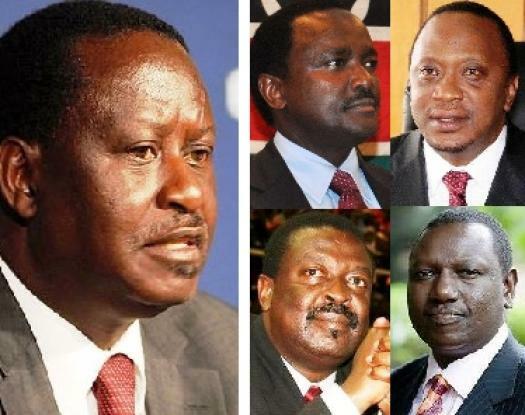 In spite of being a minister in Kibaki government, Raila galvanized the Liberal Democratic party (LDP) wing of the National Rainbow Coalition (Narc) government and teamed up with opposition then led by Uhuru Kenyatta to campaign against the draft constitution with their symbol being the Orange while Kibakiâ€™s government agitated for the passing of the constitution which was famously referred to as the Wako draft whose symbol was a banana. The government lost the referendum vote, Kibaki dissolved his cabinet, to only reconstitute it after a few days to the exclusion of Raila and other ministers who had opposed the Wako draft. This effectively led to the formation of the Orange Democratic Movement .Having been fired, Raila and his team saw that as an opportunity to start early campaigns against Kibakiâ€™s re-election in 2007. In their nationwide campaigns, the Orange group was adamant that it was time for another person to lead the country pointing at President Kibaki regimeâ€™s inability to curb rising cost of living. Mean while quiet propaganda was doing rounds of massive corruption in government by powerful clique of individuals whom they referred as Mt Kenya mafia. The group also hyped the rhetoric that the Kikuyu community had never supported any other person in pursuit for leadership except their own. This rhetoric was left unabated and by the time of going to election, it could seem that it the Kikuyu community against other 41 communities, perhaps this is what pushed Kenyatta out of the Orange group. Despite of hon. Kenyatta being an opposition leader and a viable presidential candidate in the 2007 elections, he opted out of the race and endorsed Mwai Kibaki for the second term to appease his tribesmen and also safeguard his Gatundu South parliamentary seat. The anti Kikuyu rhetoric had far reaching results. The rhetoric did not only end with politics but it created a lot of political hatred against the Kikuyu community. For that reason, when allegations of election rigging came up during the tallying of the 2007 Presidential results, the country gripped with anger and fear of continued Kikuyu presidency went up in flames. Most of the supporters of the Orange Movement could not come to terms with another five years of a Kibaki presidency. The 2007 post election violence was the darkest moment and a turning point to Kenyaâ€™s political history. It was a lesson every Kenyan learnt, all Kenyans were the ultimate losers as the result of the post election violence. The post election violence exposed Kenya to the international limelight for all wrong reasons leading to some of the countryâ€™s leaders being tried in a foreign land at the International Criminal Court at The Hague. This kind of negative exposure has tainted the image of our country and the citizenry are now faced with the challenge of restoring the dignity of our country. March 2013 elections presents an opportunity to avoid the pattern of history set in 2007.So far we have groups coming up that are threatening national security. Some groups allege to have legitimate claims that need to be addressed. Other elements are using excuses of what they call historical injustices to commit atrocities; case in point being the brutal attack meted on Fisheries Minister Hon. Amason Kingi that left the ministerâ€™s bodyguard and four others dead. Itâ€™s important for Kenyans to scrutinize the candidates who have so far presented themselves and elect a person who will put our country on the track of peace, unity and tranquility. The country needs a President who is neutral and ready to unify all communities in Kenya. The country has an opportunity to elect a level headed President who will not attract ethnic passions that are a danger to our own security and survival. Kenyans should avoid voting along ethnic lines and support a candidate who will give the country a leeway for healing and reconciliation; a President who is not a party to Kenyaâ€™s current woos. U debated well but your candidate remains hidden in your mind. I wish our people will have time to read this. ALL OF YOU CAN RWAD THIS!!!! Impressive post! This is a comprehensive coverage of Kenyan politics. I agree with your final opinion “support a candidate who will give the country a leeway for healing and reconciliation; a President who is not a party to Kenyaâ€™s current woos” This is a wake up call to all eligible Kenyan voters to vote in leaders who have a vision for this country and not their tribe. Kenya is more than an individual or tribe.